Born in 1899, Edgar Miller was a designer, painter, sculptor and master of many craft disciplines. Working out of Chicago for most of his career, he is best known for a set of four apartment complexes he designed and built during the 1920s and '30s. Every detail of the nearly 35 units in the buildings was crafted by Miller's own hand. 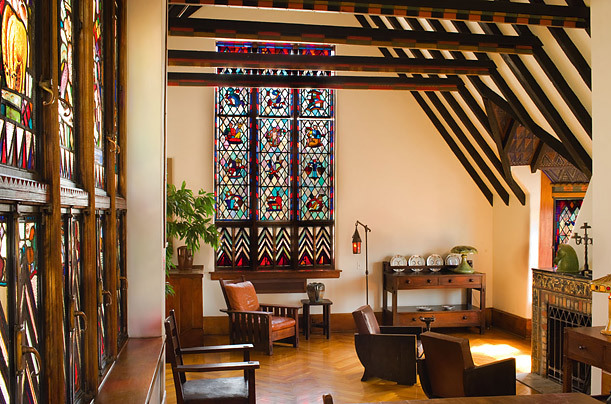 For the rear apartment, at 1734 North Wells Street, designed especially for one of the artist's patrons, Miller created medieval-themed stained-glass windows and detailed wood beams for a sloping ceiling.